Legal research skills are highly desirable and valuable for securing a training contract or pupillage and excelling in your legal profession. 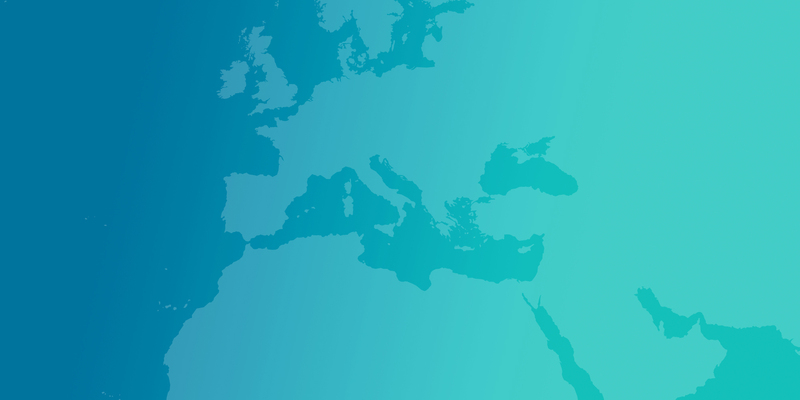 To help you prepare we’ve put together three legal research questions for you to practice, alongside guidance on how you would conduct research, without the benefit of a reading list or a known case to start from, to answer each of these questions using JustisOne. Olivia and Jack, both aged 37 have been married for seven years and live with their three children in London. They have twin girls, Sophia and Amelia, aged 6 and one boy, George, who is 4. When the twins were born, Jack (working as a vet) had a higher income and the couple decided that Olivia, who was a secondary school teacher, would remain home to take care of their three children. As George was about to start school, Olivia was planning on going back to her previous job and had started to tutor in the afternoon to get back into the routine of teaching. Over the past year, Jack has been working overtime and spending less time at home. As a result, Olivia has been relying on an old school friend, Harry, to help her with childcare while she tutors. Olivia and Harry have been growing closer over the past month and last night, Olivia admitted to Jack that her and Harry were having an affair and she was going to move in with him. She wanted the children to live with her and Harry in his home and sell her property with Jack so that Harry and she might buy a larger home together. The house is in joint names and valued at £300,000, with a remaining mortgage of £60,000. On what grounds can he end the marriage? How will their assets be divided? What will the court take into account when deciding with whom the children should live? 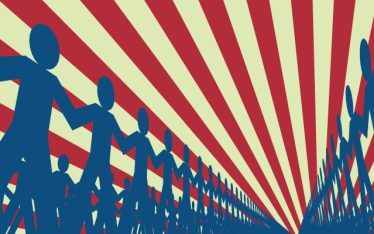 Nicola Stephenson from the Justis training team and LLB graduate shows you how to approach these questions using JustisOne. To find the appropriate answer to this question, I used the intelligent search bar found at the top of every screen on JustisOne. As the property is in England, I first set the Jurisdiction settings to the UK. To do this, I used the Settings menu to select one or more jurisdictions. The Settings menu can be found on the bottom-left of the screen in the navigation bar. To begin with, the question specified “ending of marriage”. I ran a search using this term, which at the time returned just under 40 results (a good manageable number to skim through!). Over 1,000 new cases are added to JustisOne each month, so this numbers may change in the future. JustisOne’s search results are ordered by relevance, which considers the number of times a case has been subsequently cited, number of negative and positive treatments and the level of court a case has reached. This ensures that the most relevant and leading authorities are at the top of your results. Therefore, when I ran my search for “ending of marriage”, I chose to view the first few results on the list as I was confident they would be the most authoritative and relevant. On one case I opened, the key paragraphs highlighted in purple on the overview page informed me that the case was regarding similar points of law as our example. I then used the ‘cited legislation’ tab. Here I found the Matrimonial Causes Act 1973. I clicked on the Act name to open the legislation within JustisOne. 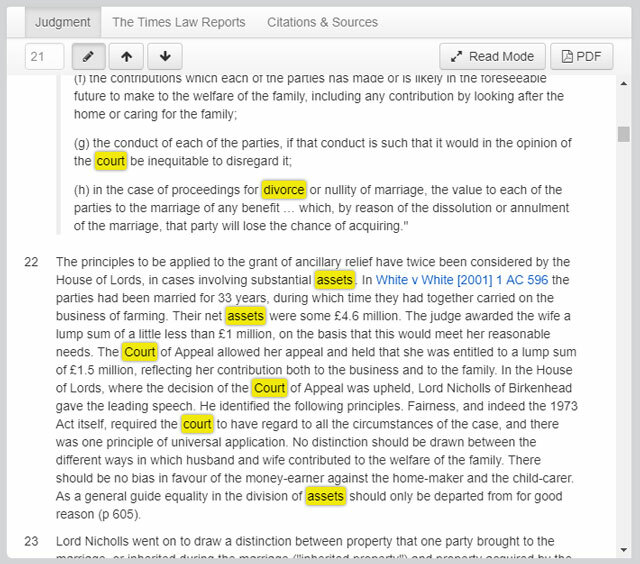 After learning about the law surrounding the grounds on which a marriage can be ended, I used the list of ‘citing cases’ to find other examples of the legislation in practice. Within the list of citing cases, I could see the flags of each jurisdiction, and quickly find relevant cases from the UK. Using this list of UK cases that had cited the relevant legislation I was able to explore relevant cases, locate the appropriate precedent for this question, and authorities to back up my answer. Using the tools in JustisOne I was able to quickly link between documents to and find the relevant documents that I needed to read to prepare the final answer to this question. The second question regarded dividing the jointly owned assets. To answer this question, I decided to use JustisOne’s Advanced Search tool to research dividing assets upon divorce in the UK. Using the navigation bar, located on the left side of the screen, I clicked on the Advanced button, to open our Advanced Search form. 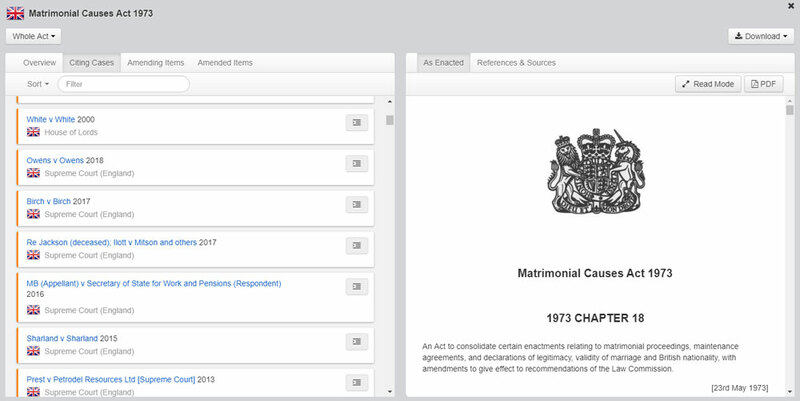 The Advanced Search form in JustisOne can be used to search specifically for Cases, Legislation and EU law by selecting the corresponding tabs. 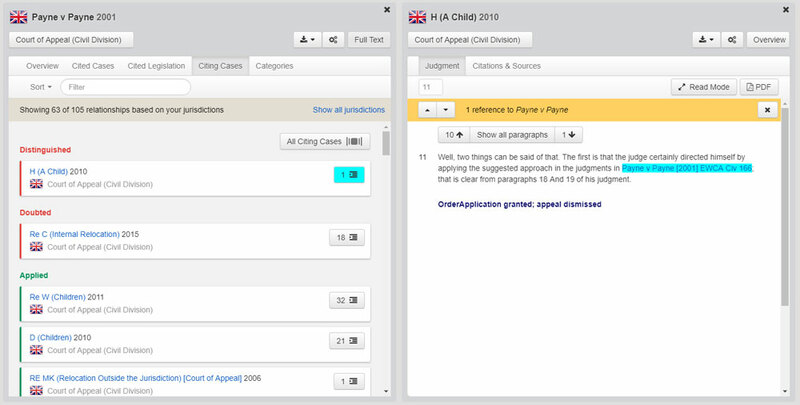 As I was unsure about the legislation and cases on this point, I searched using the ‘All’ option as a starting point. For this question, I typed ‘divorce’ and ‘assets’ into the full-text search, which produced around 2,000 results. The full-text box in the Advanced Search form can be used to find any words in a document. To reduce the number of results I decided to focus on finding precedents in this area. I returned to the Advanced Search, and using the ‘Cases’ tab, I added ‘Supreme Court’ to the court field, and ‘divorce’ and ‘assets’ into the full-text field again. This returned 23 results at the time of searching, which provided me with a much more manageable starting point for this legal research. By looking through the results, I saw each case has associated categories on each results card. On the second page of results I see there a few cases tagged with ‘Divorce’. 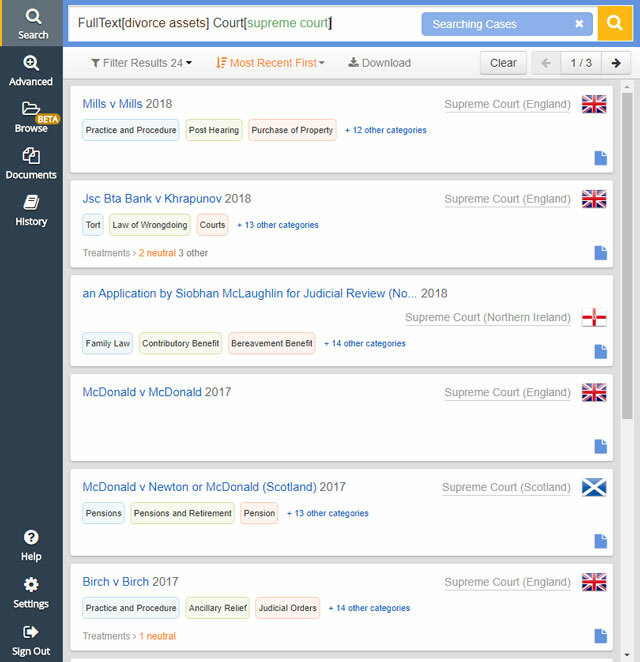 Opening one of these cases, I can use the pen tool, to highlight to the terms in the search bar, which was FullText[Divorce assets] Court[Supreme Court]. This tool therefore allowed me to see where in the judgment these terms appeared. Using the tools in JustisOne I was able to find a few specific cases as a starting point for my reading into this area, that would eventually lead me to the answer to this question. Finally, to address the child custody issue, and identify what information is relevant to the courts making this decision I used JustisOne’s Browse feature. What will the court take into account in deciding with whom the children should live? Firstly, I used the navigation bar, located on the left side of the screen, to open JustisOne’s Browse feature. This feature can be used to search for cases by category. For this question, I selected Family Law, then narrowed the search by selecting Children followed by Custody and Contact. As I am interested in what the court will take into consideration, I also select Application for Custody before searching using the ‘Find Cases’ button. I opened the first case within the results, which at the time was Payne Vs Payne, and saw from the Key Passages that the case had discussed factors of applications as well as their weightings. It was obvious that his case was a great starting point for my research. Next, I opened the Precedent Map for Payne Vs Payne, using the button in the upper right corner. I select to see the positive and negative treatments. As the Precedent Map is ordered chronologically from left to right, I instantly see that this case has recently received a negative treatment in 2015. By double-clicking on the negative citing case, the Precedent Map shifted its focus to the new case: Re C (Internal Relocation). By selecting the title at the top of the Precedent Map, I was taken straight to the case where I could view the full-text judgment. Using the ‘Cited Cases’ tab, I found Payne Vs Payne and selected the corresponding citations in context button showing me the 18 mentions of the case within Re C (Internal Relocation). I could then read the relevant paragraphs and analyse them within my answer. Using the results from my initial search, the Precedent Map, and the list of Citing and Cited cases, I continue to explore these relevant cases to find authorities that will help me answer my question. When applying for a vacation scheme or mini-pupillage, you’ll often be looking for ways to make your application stand out from the crowd. Being able to use legal technology to conduct research significantly reduces the amount of time spent on one problem and can be a really useful skill to have in the eyes of hiring firms or chambers. Many of the biggest UK firms are now offering training contracts with elements of legal technology built into them, showing the importance of this to recruiters. 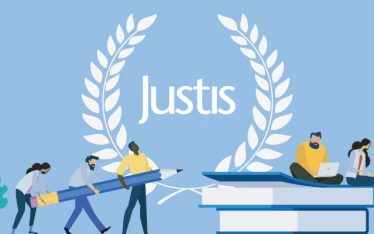 Justis offer free certificated proficiency tests that can be taken online and used on your legal CV to show prospective employers that you are skilled in this area. If you achieve over 90% in your first sitting, you will receive a pass with distinction, which will look great on any legal application. Take the JustisOne proficiency test. 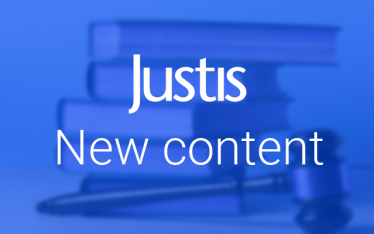 Did you know, Justis offer online training to all customers? Each training session last approximately one hour, depending on your training needs. Training sessions are conducted online so that your colleagues, staff or students can join the session remotely. We can also offer in-person training in some parts of the UK and Ireland, and can provide special training sessions for JustisOne’s Admin Portal. If you would benefit from a training session on JustisOne, please contact your law librarian.